Welcome to coastalstays.com Victoria’s most comprehensive and fastest growing coastal website providing accommodation, food, activities and attractions information on popular holiday destinations from Mallacoota in the far east to Port Fairy on the Great Ocean Road in the far west. Informative town and regional maps are featured on our websites which can be down loaded or mailed to you upon request. The Coastal Drive between Sydney and the Great Ocean Road is an amazing experience at any time of the year. Discover some of Australia’s finest coastal towns, experience spectacular scenery, take the time to explore natural and man made attractions. Weaving its way around Victoria’s south-west coast through some of Victoria’s favourite coastal towns the Great Ocean Road is one of the most magnificent, scenic coastal drives in the world and is rated one of Australia’s greatest tourism assets. 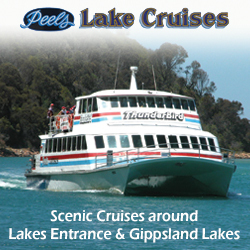 From Melbourne you travel the M1 to Torquay 20 minutes south-west of Victoria’s second largest city Geelong. 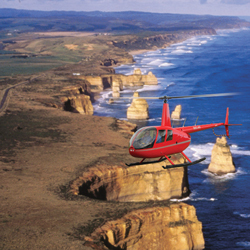 The Great Ocean Road stretches 275 kilometers from Torquay to Port Fairy. 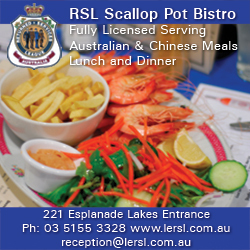 Visit major holiday resorts along the Great Ocean Road - Lorne, Apollo Bay and Warrnambool. An hours leisurely drive from Melbourne or two hours drive from Phillip Island you will discover one of Victoria’s most picturesque destinations. Defined on three sides by the waters of Port Phillip Bay, Western Port and Bass Strait the Peninsula is one of the Australia’s finest winery regions you can enjoy lunch with a glass of wine in any of the fine winery restaurants dotted throughout the Peninsula, or if golf is your passion there are 16 courses for you to play. Garden and eco tours are also popular. Phillip Island 22kms long x 9.5 kilometers wide is situated at the entrance to Western Port Bay approximately 120 kms south-east (90 minutes) from Melbourne. 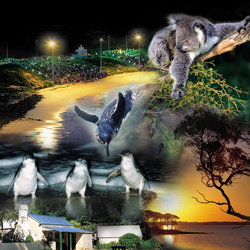 The top natural attraction in Victoria, Phillip Island averages approximately 3 million visitors annually. 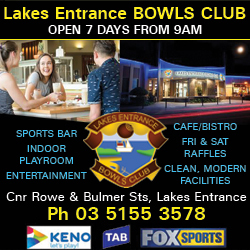 Home of the Australian Motorcycle Grand Prix in October and the World Famous Penguin Parade. 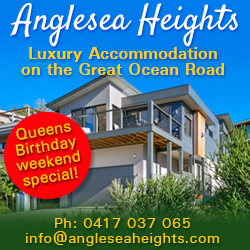 One of the state's original ports Inverloch is a rapidly growing holiday and residential seaside village situated on Anderson Inlet approximately 2 hours south-east of Melbourne via the South Gippsland and Bass Highways. Water activities never cease. Prom Country, two hours south-east of Melbourne is where rolling green hills meet ocean blue seas, and is home to the breathtaking Wilsons Promontory National Park. 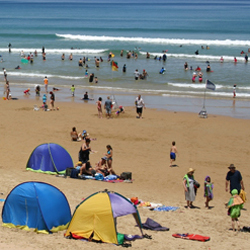 Popular and thriving beach resorts from Inverloch to Port Welshpool are scattered along the rugged south coast, renowned for excellent fishing and a less stressful holidays. 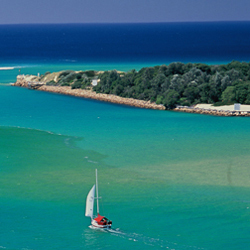 Lakes Entrance is 320 kilometres (3 hours 30 mins) south-east of Melbourne via the Princes Highway. 2 hours from Traralgon and 1 hour from Sale, 3 hours 30 minutes from Merimbula, 5 hours from Canberra and 8 hours from Sydney. Lakes Entrance is warmer and sunnier than most parts of Victoria in winter, when the temperature can rise to 18-20 degrees. Summers are milder, so the climate is perfect all year round for a weekend away or longer stay. 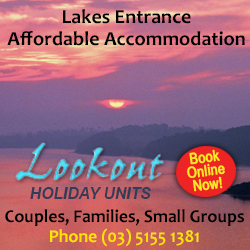 Enjoy mild winters and glorious summers in the home of the largest lake system in Australia. 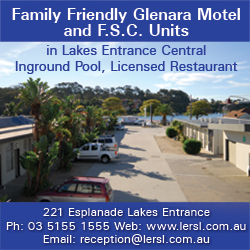 Located in the eastern corner of Victoria, surrounded by the unique Gippsland Lakes, the largest inland waterway system in Australia covering some 400 square kilometers and the spectacular Wilderness Coast incorporating Croajingolong National Park which extends some 100kms from Bemm River to the far east of Genoa, Gipsy Point, Mallacoota and Gabo Island and across the border into NSW. The first town of any significance after crossing the Victorian border Eden has a permanent population of 4000 and is situated 50 metres above sea level upon undulating land on a point that juts out into Twofold Bay. This idyllic coastal town is bounded to the north and south by National Park and woodland to the West. Bermagui is 18km off the Princes Highway and nestles around a safe, all-weather harbor dating from the 1830s. The continental shelf is just 20 km offshore – its closest point to the Australian mainland – which means exceptional deep-sea fishing. In particular, the town is known for its yellow fin tuna and the famed black marlin. Charter boats operate deep sea dive and game fishing trips. Reef, rock, beach and estuary fishing also very popular. Click on any BLUE town name in the map below to view town information. If town page fails to load in a new window, check your pop-up blocker settings (yellow bar at top or bottom of browser window). View Travel Times.